It’s the third week of August. I’m not ready for Summer to end. You’re probably not either. -I’m not ready for my hair to turn a dingy blonde. Blah. -I want to keep wearing my swimsuit all day and night on the weekends. -I like the farmer’s market and all their delightful cheap produce. -Sipping skinnygirl margaritas outside will cease, that’s a problem. -I will be cold for a good seven months. Boooo. On the bright side, there are some perks to Fall though. Baking with pumpkin, Thanksgiving, and of course giving out fruit on Halloween. Only kidding. Anyway I’ve decided I need to make the rest of this Summer memorable. Right now, I feel like Judy Moody and the Not So Bummer Summer. Don’t ever watch that movie. Gingers and Big Foots do not make for a good storyline. Ever. Lately I’ve started to try to encourage healthy family meals. It’s something that I love to do. People are happy and thankful. Food just has that soulful connection and bringing people together for a great meal is important to me. My family is away in Canada right now. I miss them. I miss cooking for them. Come home family. Hmmm… What else have I done this summer? I’ve been to a lot of potlucks this summer. Boring. Oh sorry excuse me; I don’t want to offend any potluck lovers. Potlucks are great for getting together with friends and family, but I mean what’s up with the food? Maybe it’s just me. Maybe I should get used to potato salad saturated and dripping in miracle whip. Oh, and coleslaw from the deli at the local grocer is supposed to be good? I don’t know… it tastes soggy to me. Wait, what about those weird jello cakes with cool whip? That reminds me of a nursing home. Hold on, this is just the worst: mini wieners blown up and sitting in crockpots for hours. Scary. 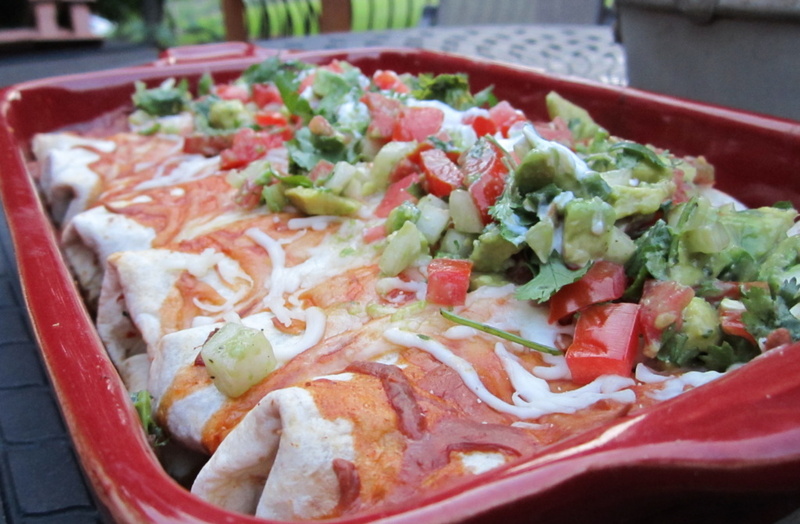 Anyway I wanted to make these enchiladas because they remind me of my family get togethers. Typically we don’t make traditional food. We get adventurous, or should I say ambitious haha. We make new meals every week. Everyone contributes to the meal and at the end we sit down happy to be in eachothers company and proud of what we created together. My taste buds love a good adventure. They like to party. These enchiladas were gone that night. 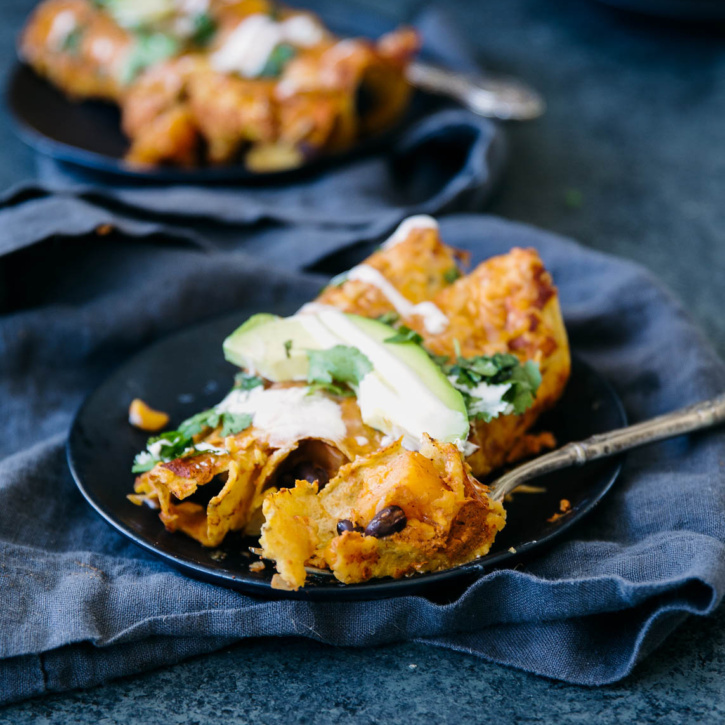 My family didn’t know that these were a healthier enchilada. About 300 calories per serving. They had multiple servings though. We had homemade sangrias, layered taco dip, and lots of chips too. Then we had my Summer Berry Peach Pie for dessert. It’s was the perfect summer meal. Put a little pizzazz in your next potluck adventure. Make these. They are healthy, yummy, and a great way to share a memory with your friends or family. 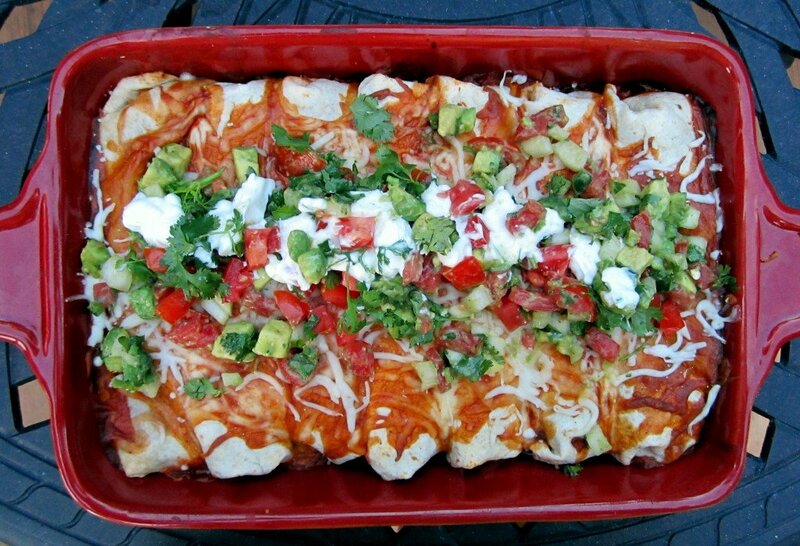 Delicious enchiladas! 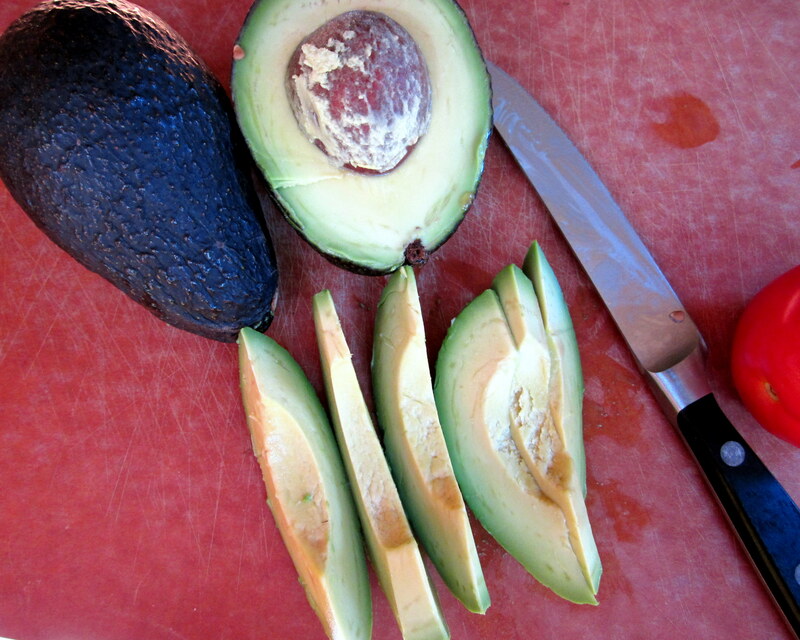 Fresh, flavorful, and better for you. Spray large pan with non-stick cooking oil and place on medium heat. Add corn, garlic, onion, red pepper flakes, cumin, garlic powder, and the optional jalapeno if you’d like. Cook until onions have softened. Next add chicken and cilantro to mixture and ½ can of the enchilada sauce. Simmer on low for a couple of minutes. Turn off heat and let mixture cool. Preheat oven to 350 degrees F. Spray 9x13 baking pan with cooking spray. Next warm tortillas in microwave for about 20 seconds so they are easier to roll. Then, place about 1/2 cup of refried beans on each tortilla. Next take about 1/2 cup of chicken mixture and place on top of beans. Sprinkle about ¼ cup of cheese in each tortilla. Fold each tortilla and place seam side down in pan. Add remaining enchilada sauce on top of the tortillas and sprinkle remaining cheese on top. Bake for 30 minutes until cheese is melted and edges of tortillas begin to turn golden brown. 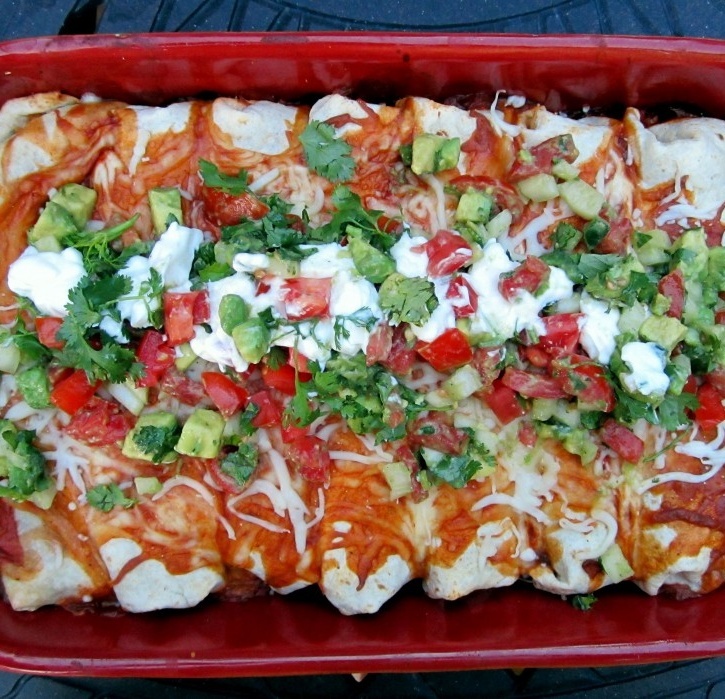 Allow enchiladas to cool a few minutes before serving and top with avocado-tomato salsa and sour cream. While enchiladas are baking, make the salsa. 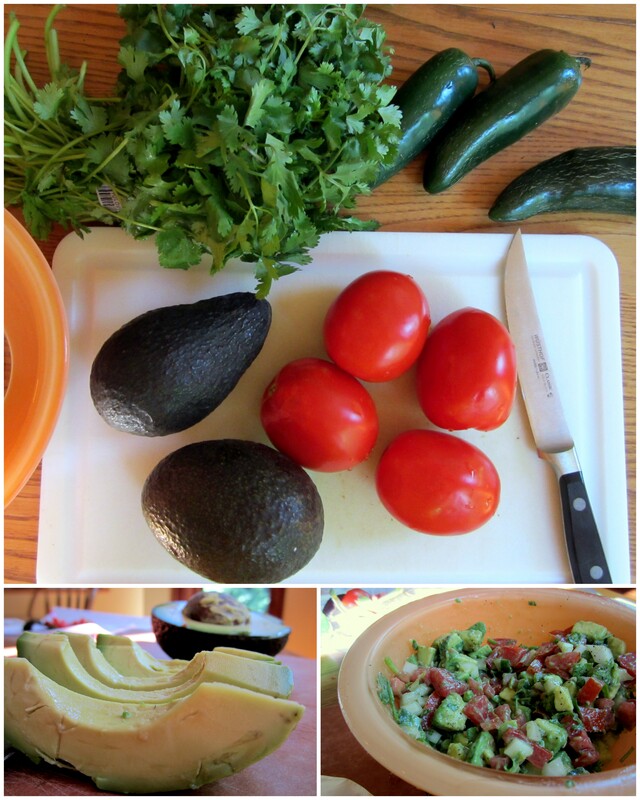 To make salsa: In a medium bowl, combine all salsa ingredients. Stir until evenly mixed. Refrigerate until ready to serve. These should make 7 large enchiladas. 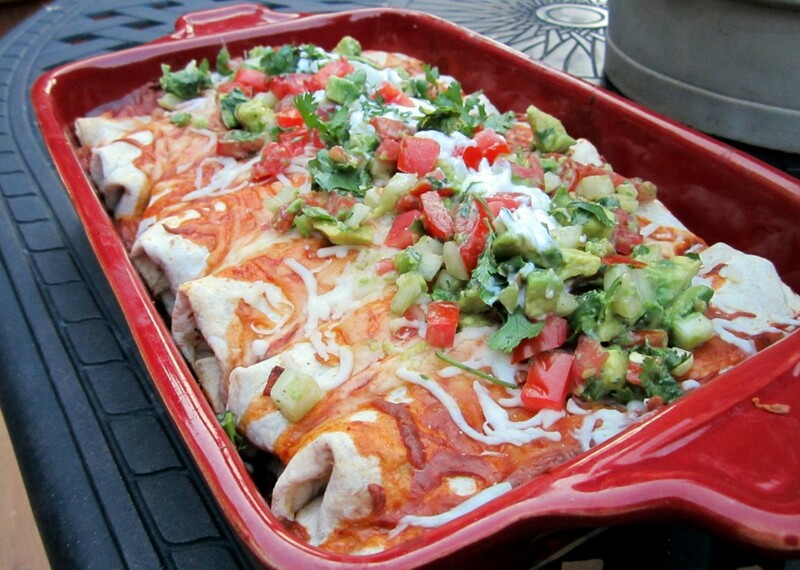 1 serving = 1/2 enchilada with salsa.